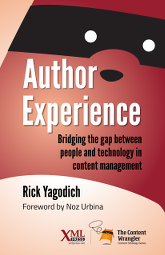 Yagodich begins Author Experience: Bridging the Gap between People and Technology in Content Management by defining “author experience” (AX), a term he coined in 2010 (p. vii). He addresses the imbalanced emphasis placed on user experience (UX) versus AX and advocates for effective content management systems (CMSes). He asserts, “If the tools are not fit for the purpose of creating and managing content, how can we ever create that optimal end user experience?” (p. 5). Yagodich argues that UX and AX should be given equal consideration when choosing a CMS. An author is not just a content originator but someone “who interacts with the CMS” (p. 7). Additionally, “Author experience, as a discipline, is the provision of contextually appropriate functionality within a content management environment” (p. 11). Yagodich makes a valid point—the intended purpose of a CMS needs to be clearly defined before purchase and implementation. This may seem obvious to some, but according to Yagodich, it is an issue that continually plagues the work environment. Yagodich argues that another common issue is IT departments are responsible for CMS purchases, and he asserts that those responsible for managing the content are not usually consulted. Therefore, he provides RFP criteria that should be applied when choosing a CMS: (a) “The content managed through the system fulfills a purpose,” and (b) “The system enables authors to manage that content properly” (p. 18). Yagodich addresses those with the power to purchase CMSes: “If you don’t invest in author experience, the value of the CMS is severely degraded, and the end-user experience is jeopardized” (p. 20). Yagodich goes on to address people, technical, process, and conceptual challenges, and he places great responsibility on the author to tackle these issues by challenging technologists and developers. The author presents an interesting “Hierarchy of Author Experience Needs,” which “starts with the reduction of pain and moves to enhancing productivity and value” (p. 53). Yagodich provides a five-step process for conducting an AX audit to evaluate a current CMS and determine the requirements for a new one. He includes design patterns in CMSes and groups them into three categories: (a) “Micro-copy management and usage patterns, (b) “Author interface patterns,” and (c) “Technical patterns” (p. 117). Yagodich admits that the AX field is relatively new, but he argues that it will eventually “become a recognized and expected part of every content system project” (p. 141). His perspective is refreshing, and he continually stresses the importance of AX with UX. Yagodich states that AX should not be an afterthought, and he expertly relays this message by providing a multitude of real-world examples to support his claims, many of which he pulls from his own professional experience. Britney Ashford has two 2 years of technical communication experience. She is a graduate student at the University of Alabama in Huntsville. Review from the February 2016 edition of STC Technical Communication. Used with permission.